Students facing problems in a traditional classroom may experience the same problems at a boarding school, but Elk River is similar to a therapeutic boarding school. The Elk River Treatment Program (ERTP) pioneered the use of comprehensive academics in a short-term residential setting. 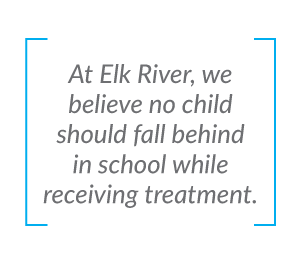 We believe no child should fall behind in school while he or she is in treatment. Mirroring our therapeutic model, highly qualified and certified educators assess the student’s academic strengths and weaknesses before an individualized course of study is developed to meet their specific needs. 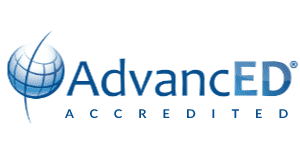 ERTP’s curriculum is accredited by AdvancED . Residents attend school year-round and are provided with independent workstations in our 2,800 square foot learning center. ERTP educators and support staff strive to match the student’s courses at ERTP with courses from their primary school. Courses include the full range of core curriculum, honors, college preparatory and elective classes. Our academic administrator works closely with parents, students and school counselors to design an individualized program of study that best supports each child’s unique educational goals. Highly qualified and state certified teachers help students become independent while building strong academic and problem-solving skills. Our academic program teaches to each student’s strengths and enables teachers to intercede immediately when conditions indicate help is needed. Close supervision and individual workstations support and motivate students to continue their education while in treatment. Individual tutoring is available in the classroom for specific subjects. Q. How do students transfer from one school to another? A. Parents must withdraw their child from one school to enroll them in another. ERTP works with the local school to match courses as best as possible. Q. What happens if I enroll my child in the middle of the school year? A. Should a student enroll in ERTP after completing ½ a semester at his/her local school, our administrators would administer a pre-assessment exam which allows a student to show proficiency in certain subjects and not repeat those lessons. Or if they may need to repeat them, the test will show that. ERTP uses grade reports, class schedules and transcripts to match courses. Q. How does my child’s school work transfer back to their primary school? A. Our self-paced curriculum allows students to move along in subjects that they are proficient in and take more time in those that they need help. If they don’t complete a credit while at ERTP, we can make arrangements for the student to finish the work online from home, or we can send a grade report to the primary school. Some school systems require a full credit before the course is considered complete. Q. Do you test to determine where my child starts at Elk River? A. Therapists administer Connor’s Testing if determined it is necessary. Supervisors take the results and make necessary adjustments to a student’s course load. Q. What is the advantage of ERTP’s curriculum? A. Accommodations that public schools are sometimes forced to make are already built into our academic program. Many students flourish in a residential school setting that complements their therapeutic program. One-on-one tutoring, smaller classrooms, self-paced workload, elimination of peer competition and streamlined coursework often lead to academic success for our students. Many continue their school work through our curriculum after leaving Elk River and earn their high school diploma. We often hear from our program graduates who have moved on to successful military careers or earn scholarships to two or four-year colleges.